Read page 1 April 2019. The Northern Cross, the independent newspaper for the Catholic Diocese of Hexham & Newcastle, has launched a new website. 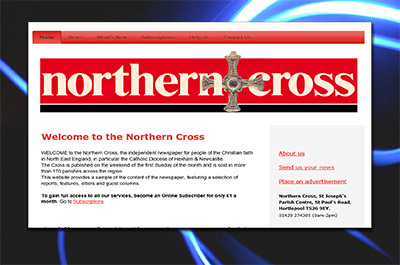 The website, www.northerncross.org.uk, transforms the monthly tabloid newspaper into a 24-7 publication capable of delivering up-to-the-minute news quickly to the Catholic and wider Christian community across the North East. One of the main features of the new website is an Online Subscription service, allowing subscribers access to the full editorial content of the current and forthcoming issues of the paper. For only £1 a month, readers throughout the world are now able to keep up to date with all that's happening in the diocese with a dynamic, real-time news service that is updated as news breaks. Subscribers to postal copies of the Northern Cross can receive the comprehensive online service free of charge. The website automatically converts to provide the clearest presentation possible on computers, tablets, smartphones and other mobile devices. Most news reports are accompanied by photographs in stunning quality and the website includes pages explaining about the history and objectives of the Cross, how to advertise, how to subscribe and who to contact. Much of the content contains hyperlinks to related pages or websites. The Northern Cross, a registered charity, is encouraging parishes, schools and organisations affiliated to the Catholic Church in the North East to place links to its website on their own internet platforms. To give feedback or to discuss the service, readers are invited to contact the editor, Emma Morton, on editor.norcross@btconnect.com.